This page was created to give you ideas of effective classroom management that works successfully, builds competent and confident students and citizens, and enables you to teach without disruptive behaviors in a safe, supportive, and positive learning environment. I integrate the ideas and practices of Jim Fay and David Funk. I highly recommend reading Teaching with Love and Logic. Check out the website for helpful tips, useful resources, and upcoming seminars! We have one class rule from Love and Logic: You can do anything you want in this class, as long as it does not cause a problem for anyone else or the learning environment. We also have an I Can chart. They are both posted in our room. We make sure to celebrate students' group and individual achievements. One way that we do this is by incorporating table tallies. The students work as table groups or teams to earn tallies for good choices, such as helping a friend pick up markers that fell or by working hard and quietly on an assignment. 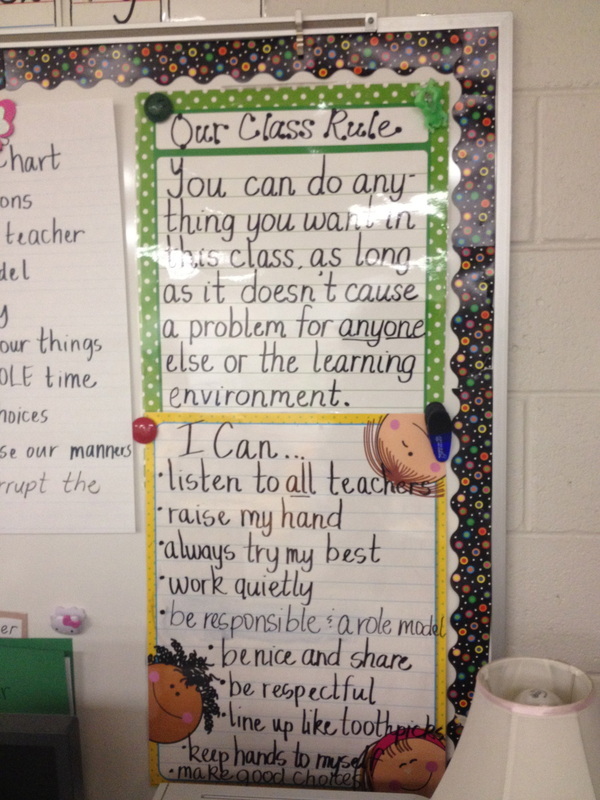 Treating everyone and everything in our school and in our classroom with respect is very important in our classroom of learning. I encourage this behavior. One activity that we do is create an imaginary classmate. 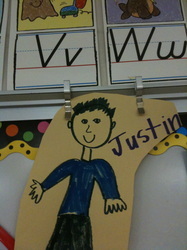 The class decided to name our special friend, Justin. The students know how important Justin is, and if we say or do something in any way that is unkind or unfriendly, we have to tear a tiny piece off of our paper friend. The kids get very upset if we have to tear a piece from Justin. 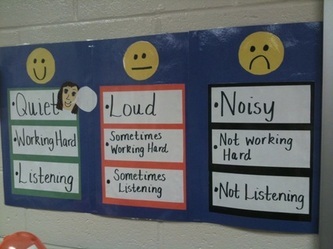 I firmly believe that this truly helps the kids understand how their words impact other people’s feelings. We celebrate all of our small achievements by participating in Dr. Jean's classroom cheers. 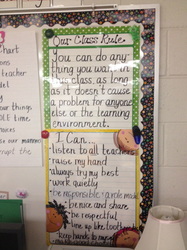 These cheers encourage the students to feel great about their work and choices! If you want to use the cheers in your class, go to Dr. Jean's summer celebrations website! I believe giving and receiving compliments is important in building our self-confidence and encouraging us to feel successful. 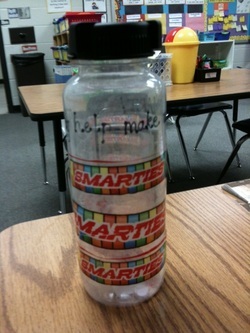 In order to value the importance of compliments, we have a Compliment Jar. 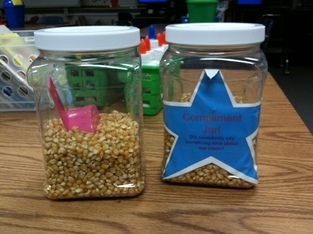 Whenever, our class receives a specific compliment from another adult in the school, we get a scoop of popcorn kernels that we add to our jar. Our goal is to get tons of compliments around the building, earning scoops to fill our jar. When our jar is full, we get a special treat! I always let the students decide what they want, whether it be a popcorn party, brownies, cookies, or cupcakes. The next day, we get to enjoy our extra special treat during recess time! The students love earning scoops! 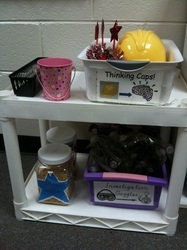 Thinking Caps give us brain power when we feel like we need a little extra something to help us with our work. Investigation Goggles help us to investigate and understand stories and math journal problems. Anytime the students need them, they go grab a pair and put them on! Students finish work at different times. To help organize this, I have something called free learning. At the beginning of the school year, we brainstorm a list of ideas of what we can do when we finish our work. 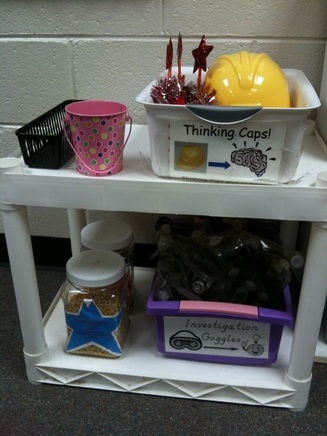 I place these ideas into an apple pocket chart and hang it in our classroom. The students know that after they finish their work and place it in the finished basket, they can choose a free learning choice from the pocket chart. We also do free learning for morning work. 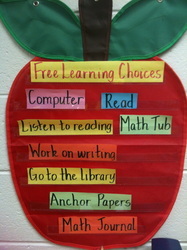 After they get unpacked and do their morning routines, they can choose a free learning choice until breakfast. What if a student does not finish the work? The students who do not finish the work put it in the More Time basket and finish it another time throughout the day or for morning work the next morning. While we walk in the hallway or take a restroom break, we often play the toothpick game. This is where we stand and pretend we are toothpicks! The kids love it and really look like toothpicks! I give out Smarties before assessments or any other time extra brain power is needed! 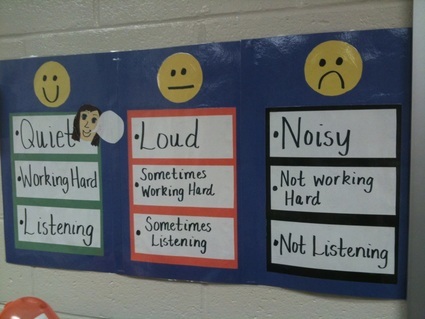 Here is an anchor chart I use for noise levels. We discuss each section thoroughly. The students understand my expectations and always strive to be on the happy face. We use this throughout the school year.